Weren't those official comic anthologies? I thought there was another one called God's in His Heaven. But I haven't seen them around in years so I can't find much about them currently. Sailor Star Dust wrote: Weren't those official comic anthologies? I thought there was another one called God's in His Heaven. Yes, my understanding is that they are effectively a pair and came out in 1997. They are recognized in the E-Mono catalog. My own search hasn't been that fruitful. 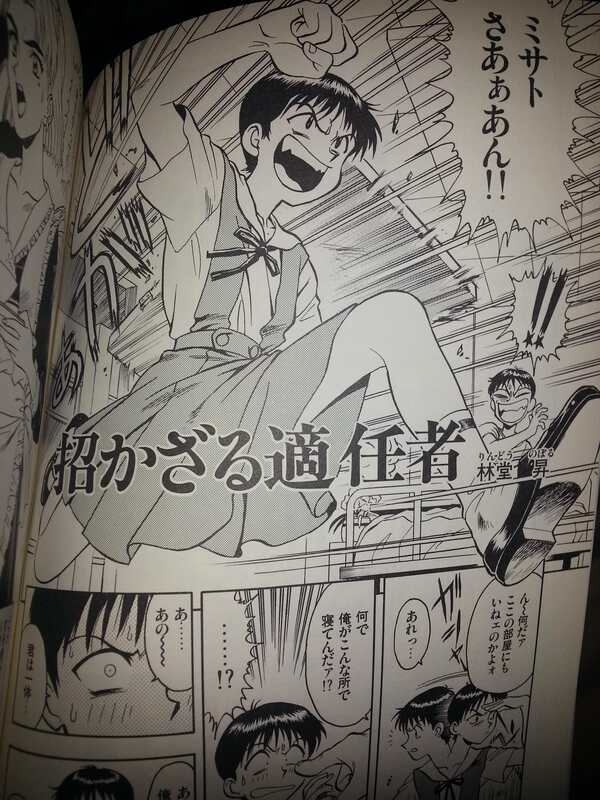 Most I've found of the specific Shinji comic were three pages of its pages that were shared in a thread at this very forum and idenfitied by SSD back then, too. I've found many physical copies of the anthology itself being sold everywhere, but no single digital trace of any of its contents (besides the already available material and the cover). All I was ble to find is what appears to be an index with the title & artists of each comic within said anthology--Maybe the actual comic's title or its artist could be recognized from that list? I haven't been able to find anything using the artist's names nor the comic's titles, though. There might be a chance that the comic itself was reprinted in another entirely different compilation/anthology (as many other Eva comics were at the time), and then got translated by mere chance without being part of its original context--Only way to find out, I'm afraid, would be to scan through the entire english translated database of Eva doujins available (specially at that one site that has many old Eva doujins), and try to find it through plain ol' eye scanning. Just checked my PMs and you sold me a copy in 2012. AR-99 wrote: Just checked my PMs and you sold me a copy in 2012. The bigger question though is do you still have it? Going back to Zereus' link, this is the story: 「招かざる適任者」by	林堂昇. It's 12 pages and goes from p. 43-54. Last edited by AR-99 on Mon Jun 18, 2018 3:08 pm, edited 1 time in total. And for the Ritsuko fans, she is in a maid outfit. Seeing the picture jogged my memory: Shinji clones were running amok (one of 'em captured Asuka ) and the real Shinji was at a complete loss on what to do + blamed for everything! I think the punch line was they all ended up in some spare Reiquarium tanks (including real Shinji? ). Also: That link by Zeruss further reminded me how damn silly Photobucket's current policies are....Sigh.